YOUR MAMAS NOTES: As it turns out late night chat show host and comedian Jimmy Kimmel isn't the only high-profile Tinseltowner to recently create a small compound up in the hills behind the Chateau Marmont Hotel in Los Angeles, CA. 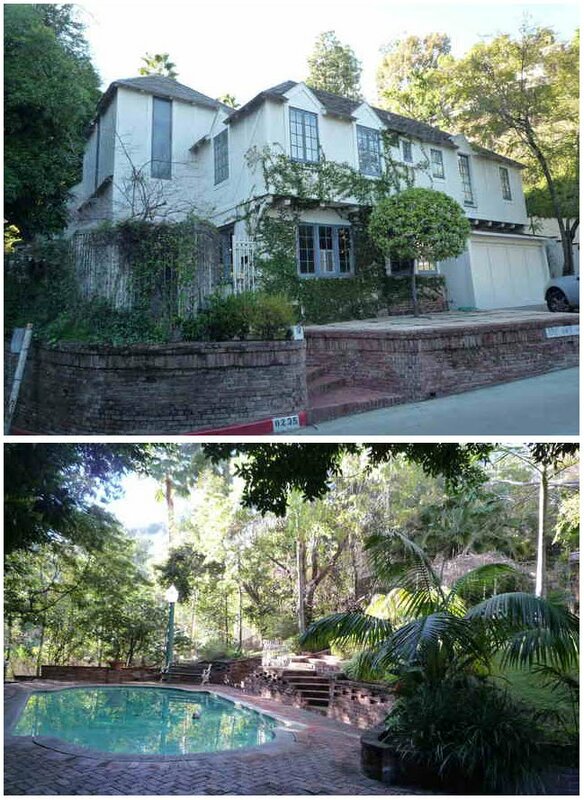 In March of 2007, property records show actor/writer/producer/composer/comedian Jason Segel forked over $2,240,000 to purchase a 2,876 square foot Spanish-style casa with 4 bedrooms and 4 bathrooms. Thanks to our friend and informant Lucy Spillerguts we've recently come to understand that in May of 2010, Mister Segel paid another $1,849,000 for the two-parcel spread immediately next door to his previously purchased residence. In addition to the 5 bedroom and 3 bathroom faux French Normandy chateau-style residence called the Villa Chateau (shown above) the property has a private swimming pool with brick terrace that with a nip and tuck could be every bit as sensational as the fabled oval cement pond at the Chateau Marmont. Put on your thinking caps, children, and recognize that Your Mama does not know or claim to know a damn thing about Mister Segel's real estate motivations as they relate to the purchase of this property. However, we can imagine that it may one day prove a savvy investment. If hotelier Andre Balazs–the cosmopolitan proprietor of the Chateau Marmont–ever wants to expand his historic hotel the proximity of Mister Segel's properties might just make their annexation highly desirable. Six-foot-four Mister Segel is best known for his affiliation and professional collaborations with budding Hollywood honcho Judd Apatow and his role on the long-running sitcom How I Met Your Mother. Extra celeb real estate tidbit: Mister Segel's house sits sugar-borrowing distance from the fully-renovated Spanish-style residence that Oscar-nominated actor/artist (and Academy Award show host) James Franco sold in February of 2010 for $3,300,000. Wow! I think Jase is one savvy boy...well, being in"business" with Apotow is obviously a good move, and I think you are right about the potential expansion prospects of the iconic digs down the hill! The pool area looks very Oz native (that's Australian, not wear Dorothy hung out)! I like this a lot. Not just for the Normandy style, but for Segal's savvy maneuver. Andre Balzacs may indeed make him a very wealthy man one of these days. And in the meantime, he has a gorgeous property. It is a sizable lot for the area, but I always believed that he bought this as an investment. After all, having one's own pool in SoCal is pretty much de rigueur ––– I know I wouldn't want one that is in constant shade because it has the Chateau looming over it to the south, not to mention a near public spectacle, with all those hotel rooms overlooking it. Just incase somehow you were not aware the official anniston listing is on jade mills website (though I'm sure you aready know this). List price $42 million!! Thats alot of schekles. There a few listing photos but nothing compared to the a.d spread. Thanks for linking to the pictures of Franco's house. That's an Impressive renovation interior in that Elle Decor kind of way. Mama, you've been holding back. You have some very interesting write-ups on ShelterPop. Franco's reno was beautiful. Regarding Jason Segel, he seems to have made better real estate decisions than Neil Patrick Harris. another mold-infested pile of garbage that gets it's credibility being next to an equally over-rated mold-infested pile of garbage known as "The Chateau Marmont". Segal or Segel? The internets have him both ways but it seems to be Segel. Luke220 sez Segel. Anon7:22p - don't knock the mold! Some of our finest sinus infections and pustular rashes come from piles of garbage!